Amazon, facing growing political and organizing pressure, announced it was setting a minimum wage of $15 an hour for its U.S. workforce. Photo: Tony Webster, CC BY-SA 2.0 / cropped from original. Last week saw that truth on broad display as Amazon, facing growing political and organizing pressure, announced it was setting a minimum wage of $15 an hour for its U.S. workforce and also raising wages in England. Back in the U.S., Sen. Bernie Sanders (I-VT) went after the company for paying such poor wages that much of its workforce is dependent on public benefits like food stamps, housing subsidies, and Medicaid. Naturally, Amazon executives sought to pivot talk away from corporate concession and towards business enlightenment. “We listened to our critics, thought hard about what we wanted to do, and decided we want to lead,” said Jeff Bezos, Amazon’s founder and CEO. The political establishment lavished kudos on the company, valued at $1 trillion, and CEO Bezos, whose net wealth tops $150 billion, for its generosity to workers. “An outstanding move,” gushed the Seattle Times editorial board in Amazon’s hometown. “Prime Amazon: In praise of the internet giant's $15 hourly wage,” trumpeted the New York Daily News headline. Fellow billionaire Nick Hanauer teamed up with union leader David Rolf to heap praise on the company. “Amazon has smartly chosen to lead the way into the real economy, where we solve the problems, build the things, and pay the wages that truly make America great,” Hanauer and Rolf wrote just hours after the company made the announcement. And while rolling out the new wage rate with great fanfare, Amazon more quietly informed workers the company would be eliminating stock options and performance bonuses. For full-time workers in the company’s warehouses, those compensation add-ons had pushed them above $15 an hour. But no more. Many full-time workers will see minimal raises—or even net declines. Facing sharp backlash, Amazon this week conceded they'd give additional pay raises to the full-timers to make up for the lost bonuses. How this latest twist plays out for the full-time workers remains to be seen. But suffice it to say, the raises won't drain company coffers. October 2 was the big announcement day. When a New Jersey fulfillment center manager excitedly announced the raise to a gathering of night-shift Amazon workers, the room remained silent, reported one of the workers. It was only when human resources staff started clapping aggressively that others gamely joined in, he said. His colleagues will accept the raise since they have bills to pay, but because of the punishing pace, “Workers hate the company. People feel they’re treated like they are slaves,” he explained. Those issues share a common root: A business model that implacably demands that workers submit to inhumane levels of exploitation. Unlike in Europe, where many Amazon workers have organized into unions, struck, and won modest gains, U.S. workers aren’t yet unified in sufficient numbers to make big demands on the corporate giant. And yet, even with these gains, workers aren’t making it. Nearly 80 percent of full-time American workers say they live paycheck-to-paycheck, 71 percent are in debt, and most workers are unable to build up savings to get through a medical, employment, or housing crisis. America is, today, a nation of spectacular wealth enjoyed by the gilded one percent while tens of millions daily teeter on the brink of financial ruin and destitution. Jonathan Rosenblum is a writer and union and community organizer based in Seattle, WA. 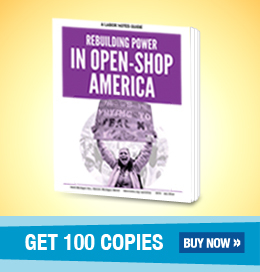 He is the author of Beyond $15: Immigrant Workers, Faith Activists, and the Revival of the Labor Movement (Beacon Press, 2017), and a member of the National Writers Union/UAW 1981. Find him online at jonathanrosenblum.org/ or Twitter: @jonathan4212. Originally published on the Beacon Broadside blog.